I’d only listened to the first three tracks of the download that The Indigos sent me when I e-mailed them back asking for a CD. SHINE ON ME is wonderful. Oh; you want more detail? The opening track had me hooked from the guitar intro and when Zep Santos’ smoky voice enters the fray I would have gone week at the knees if I’d been that way inclined. The love song itself is cleverly written; but the arrangement, including occasional guitar flourishes is as good a first track I’ve heard in years. By the time you get to track #4 No One To Blame I defy anyone not to stop what they are doing; pour something cold and strong and just kick back and forget all of the woes of the world. Long Beard Man is a very interesting song; at first glance it’s possibly about a homeless man who still has his dignity; but when you peel away the layers it just might be a deep song about Religion and possibly God or Jesus; I’ll leave it up to you to decide. I quickly developed a soft spot for Pray, So You Love Me possibly because of the occasional organ parts or it might be the intricate electric guitar playing or maybe it’s everything jumbled together that makes this a really, really memorable track. Santos sings in English; not his first language but you’d never guess and the band are all immaculate as they bring emotion, passion and subtly to every single song; and the songs themselves just might take your breath away. 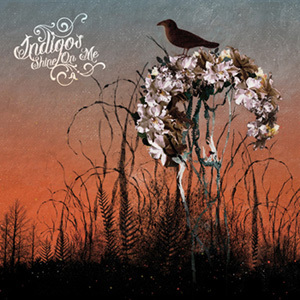 Although The Indigos hail from Spain they remind me of a heady mixture of Howe Gelb, The Fleet Foxes, Calexico and latter-day Leonard Cohen.